Quick, I need a ________! It’s a common phrase these days with the blanks filled in with such things as ‘pair of mittens for my kids teacher’ ‘scarf for Aunt Betty’ or ‘hat for my husband’. 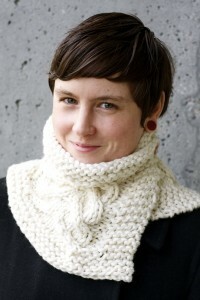 Well, here is a quick knit that is sure to please, the Stag Scarf. This is a design of my own that I’ve knit for many a gal in my circle. It knits up nice and quick (I knit this white one in an evening) but it still has some nice cabled detail. I also enjoy anything that showcases a pretty button. 2 skeins of Spud and Chloe Outer, or perhaps some Blue Sky Alpacas Bulky and size 13mm needles are all you need! This entry was posted on Friday, December 9th, 2011 at 11:38 am	and is filed under Uncategorized. You can follow any responses to this entry through the RSS 2.0 feed. Both comments and pings are currently closed. Sounds great but where’s the picture? Hilarious, my computer was having a fight with WordPress about whether or not I would be allowed to add a photo. I got mad and put the laptop down! Pics up now….